"Borussiae Occidentalis Tabula". Orig. 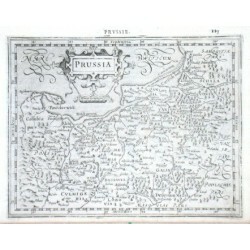 copper-engraving after D. D. Büsching's map of the region. Published in Nürnberg, 1775. Original old colouring. 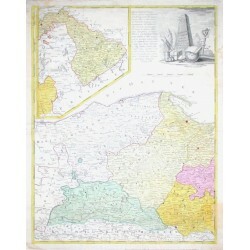 With decorative title-cartouche and inset map of eastern part of Borussia (27:23 cm). 57,5:45 cm. "Prussia". 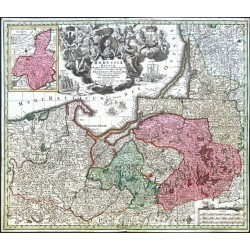 Copper-engraving according to G. Mercator's map of the region. Published by J. Hondius in Amsterdam, 1608. 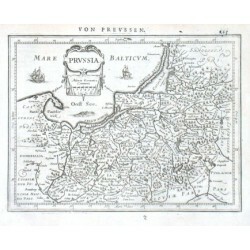 With ornamental title-cartouche, French title above the map ("Prvssie.") and "Miliaria Germanica Co:". 15:19,5 cm.